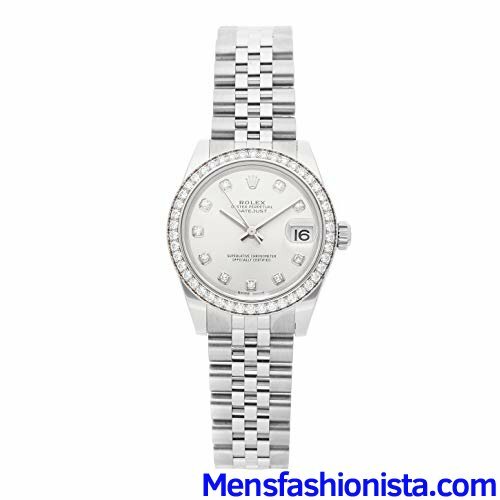 Rolex Datejust (178384) self-winding automatic watch features a 31mm stainless steel case with diamond bezel surrounding a silver diamond dial on a stainless steel Jubilee bracelet with folding buckle. Functions include hours minutes seconds and date. This watch comes complete with box and papers. Scattered Serial. Majority of time remaining on the factory warranty! No name in the watch world approaches the stature of Rolex. Literally a synonym for quality and a household name that transcends the watch industry Rolex is both an impeccable manufacture of segment-leading products and an article of international pop culture. Owned and operated by a non-profit foundation Rolex has no need to chase fads or follow trends. Rolex watches are defined by enduring design relentless refinement and rejection of planned obsolescence. The company’s legendary models include the Datejust Submariner Day-Date GMT-Master II Explorer and Cosmograph Daytona.Rolex Datejust (178384) self-winding automatic watch features a 31mm stainless steel case with diamond bezel surrounding a silver diamond dial on a stainless steel Jubilee bracelet with folding buckle. Functions include hours minutes seconds and date. This watch comes complete with box and papers. Scattered Serial. Majority of time remaining on the factory warranty!